This ended up more like a full salad (maybe a take on Panzanella? ), I mean you can barely see the toast. But so delicious and just perfect for warm summer days. Start with your toast as per usual. Add some greens (I didn’t have any arugula on hand so I went with mixed baby greens and raddicchio, but the peppery flavor of arugula is amazing with watermelon), then pile on watermelon cubes. Top with crumbled feta and a drizzle of balsamic glaze (regular balsamic vinegar will also do). This is one I know you will want to repeat, with or without the toast. 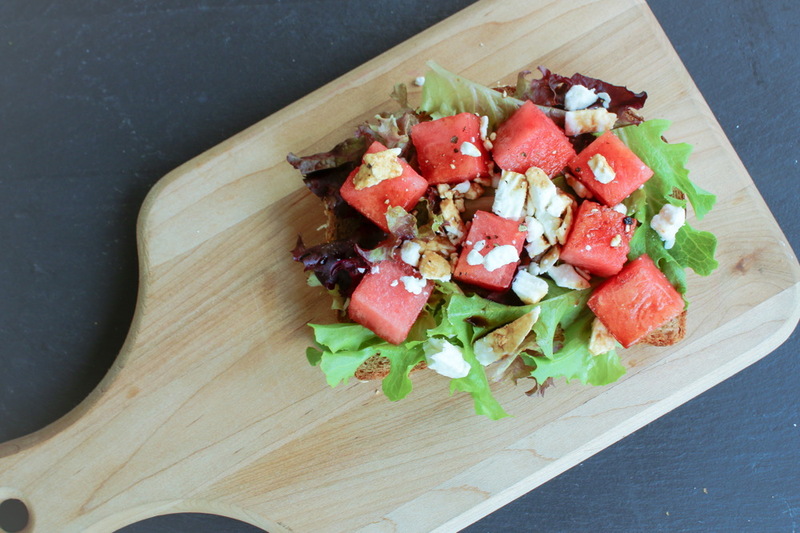 I love watermelon and feta together!